What You Need To Know About Mattresses - Which? From firmness to spring density, we highlight the mattress features you need to know about if you want to find the mattress that’s right for you. Mattresses may seem simple enough, but when you're at the shops you're likely to come across various features and terms that you need to know about if you want to sleep soundly. We've talked to our mattress experts to give you the answers you need before buying. Are 'orthopedic' mattresses really better for you? Does a greater spring density offer more support? What exactly is memory foam? Find out below. Once you're up to speed on mattresses, don't forget to check out our mattress reviews and guide to the best mattress brands. These types of mattresses are a recent addition to the market. They are sold online direct from manufacturer to consumer and delivered vacuum-packed into a box. Many bed-in-a-box mattresses come with long sleep trials, during which time you can return the mattress for a full refund if you decide you don't like it. To see which ones passed our rigorous tests, read our top bed-in-a-box mattresses. Contrary to popular belief, a mattress doesn’t have to be hard to be good for you. How firm it is comes down to personal preference, as long as it does a good job of supporting your body. We measure the shape of a person's body at 36 different points both when standing up and lying down on the mattress - this way we can tell how well the mattress keeps your spine in the same shape as when you're standing up. For each mattress, check our body-support test scores for both lying on your back and lying on your side, and read our full mattress reviews to find the one that's right for you. This isn’t to be mistaken with memory foam; instead foam is simply a synthetic sponge-like material. It doesn’t react to your body heat like memory foam does, but it is more affordable and still offers strong support. Often memory foam mattresses will have a top layer of memory foam and a base layer of firmer foam, in order to decrease the cost but still offer strong support. Handles help with flipping, turning and positioning the mattress. Many new bed mattresses don’t need to be flipped over, but they may still benefit from being rotated from head to foot a few times a year. Memory-foam mattresses are a good example of this - most manufacturers don't advise flipping, but you should use the handles to rotate the mattress from time to time. 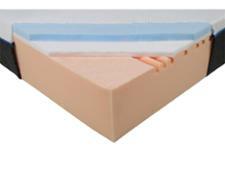 This is a less common type of mattress which features a core made up of layers of springy latex. These mattresses tend to be more expensive, but manufacturers claim that they are more durable and are better able to better keep their shape. 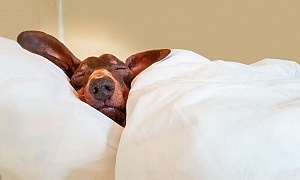 Latex mattresses can come in three varieties; natural, which is made using rubber tree sap; synthetic which uses a man-made rubber; and combination, which uses a bit of both. Some mattresses come with a removable cover, which is handy if you're expecting to have to wash the mattress. If the mattress you want to buy doesn't come with a cover, you can buy a cover separately. 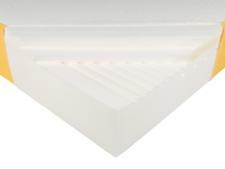 A mattress topper is an easy way to make your mattress more comfortable. 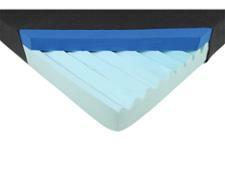 It sits on top of a mattress, offering a layer of memory foam or extra padding. 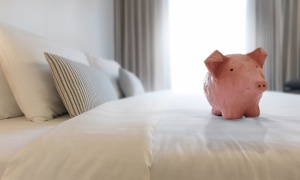 You can buy a mattress topper for as little as £10 – although most cost more than that. 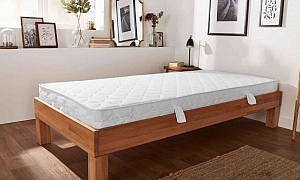 We've found that the quality of mattress toppers can vary, with some offering more comfort than others. Read our review of the best mattress topper brands to find out which you should go for. This is a petroleum-based temperature-sensitive viscoelastic material, or in plain words, a man-made foam which softens and contours when subjected to body heat. Mattresses are never made entirely of memory foam, but ‘memory foam mattresses’ are simply topped with a layer of memory foam. This makes the shape of the mattress change to fit the shape of your body, and it also tends to make the mattress feel warmer. Everything you need to know about this increasingly popular type of mattress can be found in our memory foam mattresses guide – and find out which are our top memory foam mattresses. Medical-sounding terms, such as ‘orthopedic’ and ‘posturepedic’, don't necessarily mean a mattress is better for you. There are no restrictions on the term 'orthopedic mattress', so any mattress can use that description. The body-support rating we give in our mattress reviews shows how well each mattress keeps your spine in its natural position. This is your best guide to finding one that's good for your back. Mattresses with spring systems are usually padded with man-made polymers, but some contain natural fibres such as horsehair or wool. These layers can affect firmness and breathability, both of which we test in every mattress. But more layers aren’t always better – the support from the springs is more important. Find out which excelled in our tests by reading our top pocket sprung mattresses. Some mattresses come vacuum-packed in a handy cotton bag, so you can take these rolled-up mattresses home with you instead of waiting for delivery. Now that you know about mattress features, you're well-placed to pick the perfect mattress for you using our exclusive mattress reviews. When it comes to springs, it's quality rather than quantity that's important. The number of springs in your mattress is less important than how they’re constructed. Which? has tested mattresses with densities ranging from 440 to 1,085 springs and found wide variation in the level of support offered.